It is my version of an Onde Onde cake. 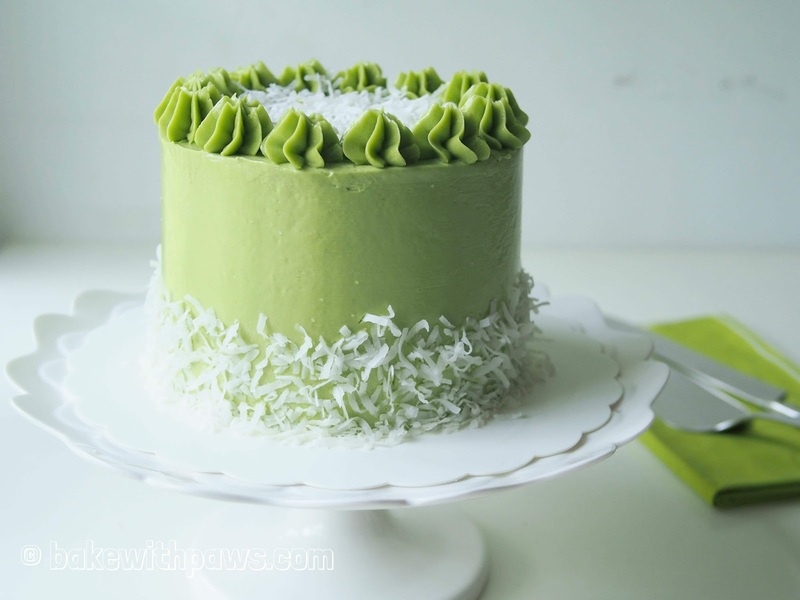 It is actually a Pandan Cake with Pandan Swiss Meringue Buttercream icing, coated with dried coconut flakes and layered inside with Gula Melaka filling. My hubby said the cake perfectly mirrors the flavours of Onde Onde. Chop pandan leaves into chunks, pop in a food processor and add boil water. Blend till fine. Place pandan leaves in a muslin bag and squeeze out the juice. If you don’t have a muslin bag, just use your clean hand to squeeze out the juice through a sieve. If you like your pandan juice to be more concentrate, leave the pandan juice in the fridge for 3 - 5 nights. The chlorophyll will sink. The longer the better. Pour away the top layer. Use the concentrated pandan juice in the bottom. Heat corn oil in sauce pan over low heat until it bubbles, then add in the shifted flour mixture and mix well. Remove from heat and transfer to a mixing bowl. Then add in milk and pandan mixture, mix with spatula until all incorporated. Gradually add in the egg yolk, stirring with a spatula or hand whisk until smooth. Set aside. Baked in water bath at 160C for 60 minutes. After 1 hour, remove the water bath and continue baking for another 10 - 20 minutes. The temperature and time duration are just as a guide. Please adjust accordingly to your oven. Unmould as soon as you can. To remove the cake from the pan, run a thin-bladed knife around the inside of the pan and invert the cake on non-stick baking paper. Peel off baking paper from the base and re-invert onto a rack to cool. Note: Add flour in heated oil is called Cooked Dough or Tang Mian method. The cooked flour will make the cake more softer. However, it is fine if you want to omit this step. Once the buttercream become smooth, add in salt until well incorporated. Please do not add all pandan juice at one time, start with 2 tablespoons first then slowly add in as you do not want your buttercream become too soft. Turn down the speed and add in pandan juice one tablespoon at a time. Scrap the bowl with spatula and beat until all well combined. I used 4 ½ tablespoon. You are not required to use all pandan juice. Tools: Cake board, cake turntable, off-set spatula, icing smoother, piping bags, round tip nozzle and swirls nozzle. Trim the cakes if necessary and cut the cakes horizontally into half. Then place half on a cake board. Place the cake on turntable. Spread a layer of Pandan Meringue Buttercream (PSMB) on top of the cake then sprinkle with gula melaka. Spread a layer of PSMB on the bottom of second piece of cake, then stake on top. Continue the same on the rest of the layers. Crumb coat the entire cake and leave in the fridge for 10 minutes. Place PSMB in a piping bag fitted with a plain round tip. Remove cake from the fridge. Pipe rings around the cake starting from the bottom till the top. This is seriously just too perfect cake!! I love the simplicity of wonderful flavor. Thank you for the compliment and glad that you like this cake. 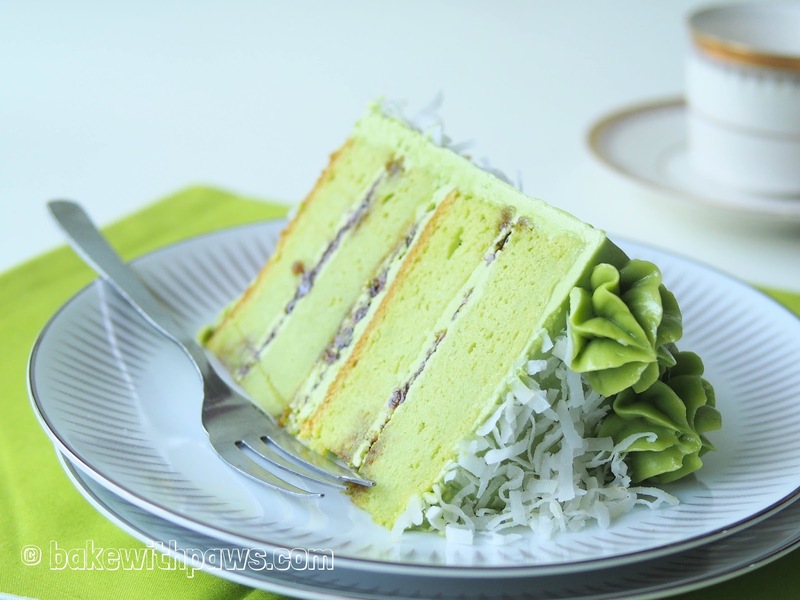 Hai..i love your website.. i just wondering what is the difference between onde onde cake and pandan guka malaka cake with swiss meringue buttercream?.. thanks so much.. I think you are referring to Onde Onde vs Pandan Cake with Gula Melaka Swiss Meringue Buttercream. The cake itself is the same, both are made from Pandan Cake. Buttercream for Onde Onde is mixed with Pandan paste and Gula Melaka SMBC is mixed with Gula Melaka syrup. Hi does this taste very sweet with the gula Melaka added in between? Thank you for dropping by and question. Some people like it and maybe too sweet for some people. Another option is make gula melaka syrup and blend into the plain swiss meringue buttercream. Then spread in between layers of the cake. I live in Singapore and I am worried about the swiss meringue buttercream melting in the heat! How did your SMBC fare when you assembled the cake? Thank you for dropping by. We are in the same climate:) I would advise you to assemble your cake in the air-con room. Please place your SMBC in the fridge while you are working at other things, even though just few minutes. Hi there! I live in Singapore and I am worried about the SMBC melting in the heat. How did your SMBC fare when you assembled it? I am so sorry for the late response. As long as you are in Air-con room that it will be fine. I never encountered this problem unless you left it out for few hours. Hi just wnat to find out can i use the coconut milk to replace fresh milk . Thank you for dropping by. Yes, you can replace fresh milk with coconut milk. But, I would advise to use the can or box coconut milk or the first press of the coconut milk. Thank you for dropping by. I never used fresh coconut. The colour maybe brown if you microwave/air fry. I guess should be ok if you don't mind brown colour. But, definitely not raw coconut. You may also use desiccated coconut. It is up to your preference. Thank you for dropping by. I used salted butter. Thank you for asking. I patched with Gula Melaka Swiss Meringue Buttercream. 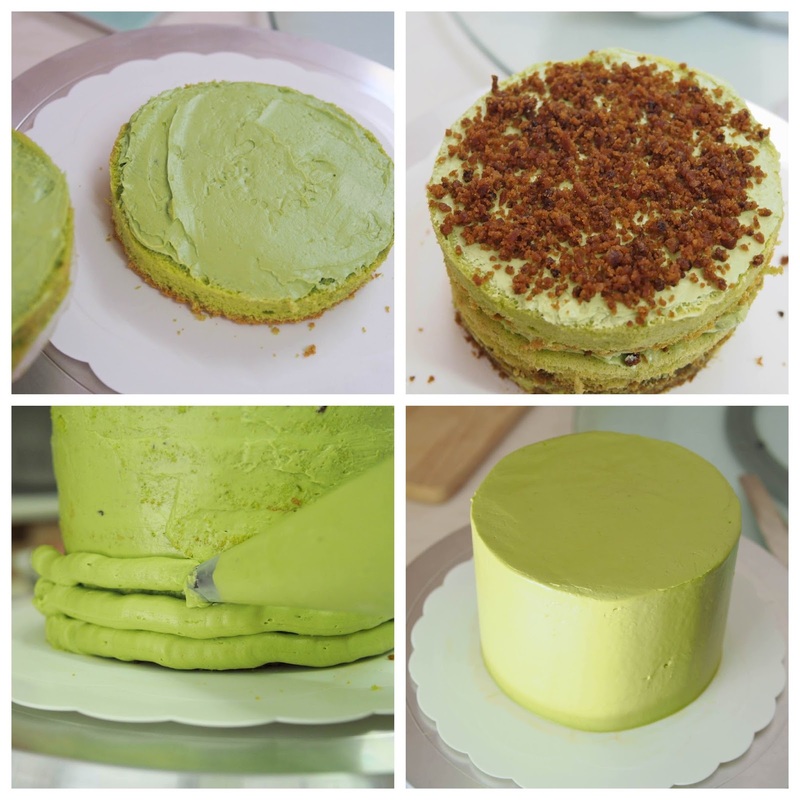 You may refer to the below link for Gula Melaka Buttercream. Thank you for asking. I have not tried this recipe with green tea powder. You can omit the pandan juice. But, you need to increase the full cream milk amount if you want to try this recipe with green tea powder. Thanks for sharing. Whats the purpose of water bath bake? Can i do normal bake instead? Thank you for dropping by. Water bath will add moisture to the oven and prevent the cake from cracking. I am afraid your cake will crack very badly if you use normal baking. 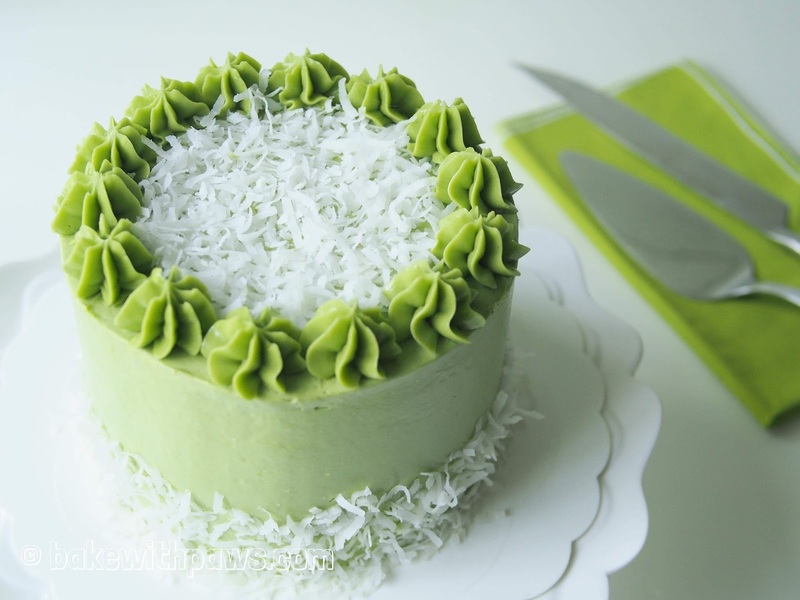 Hi, your cake really love awesome. .
Can I replace the pandan juice to the paste? Thank you for your question and compliment. Yes, you can replace with pandan paste. But, I am not sure the amount as I never used pandan paste in my baking. Thank you for your question. Please use top and bottom heat. It is not advisable to use fan mode as it will be too hot and the cake will crack.